Akhil Niyogi, this eminent author also known the pen name as- 'Swapan Buro. He wrote many popular stories for children and elder. He also known as a poet. His best compositions are- Sat Samudra Taro Nadir Pare, Hasir Halla, Ghurnipake, Duranter Dasyipana etc. Today's sharable book is 'Babui Basa Boarding', it is an another most teenage novel of this author. 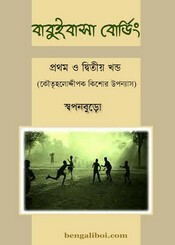 Readers can get two parts of the novel from this post, as pdf file and quality also good.